This is a very common food found in dim sum restaurants. I love the spiral layers of these pastry. They are so beautiful aren’t they? Unfortunately, these pretty ones are like pretty women– they require lots of work. 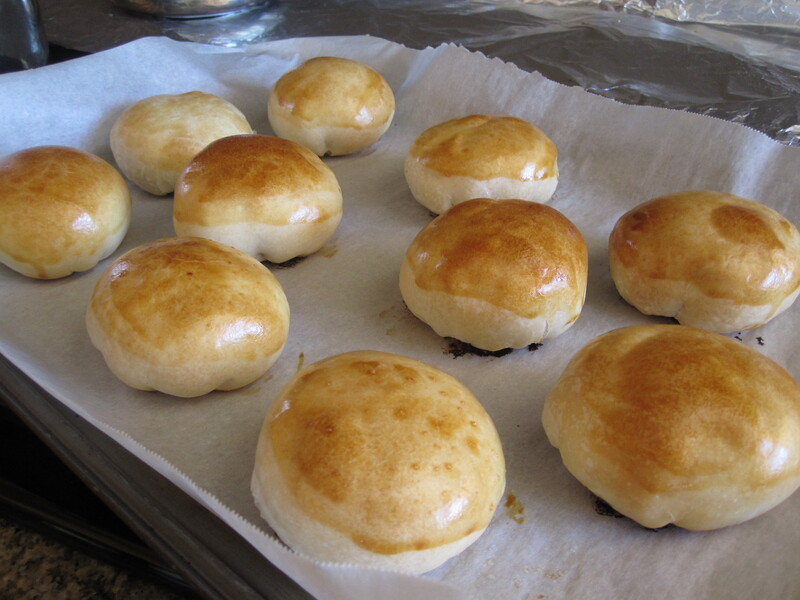 Well, I think all Chinese pastry dough that call for water dough and oil dough require lots of effort in general. But, they well worth the time. With 3 busy kids on hand, I have to divide the work into 3 days– one day to cook the fillings, one day to make the dough, and one day to bake. Prepare water dough: Combine both flours and icing sugar in a bowl. Rub in butter until it resembles coarse meal. Add in enough water to form a dough. Knead the dough until it is smooth, about 5 minutes. Wrap with a plastic wrap and chill in the fridge for 20 minutes. Prepare oil dough: In a separate bowl, rub shortening into cake flour and slowly form into a dough. Knead a couple of time. Divide into 6 pieces and roll each into a ball. Remove water dough from the fridge. Knead for a few more time. Then divide into 6 portions, and roll each piece into a ball. Take a piece of water dough, flatten with your palm. Wrap in a piece of oil dough (avoid air pocket between two pieces of dough). Pinch to seal tight. With the sealed side facing up, flatten the dough with your palm again. 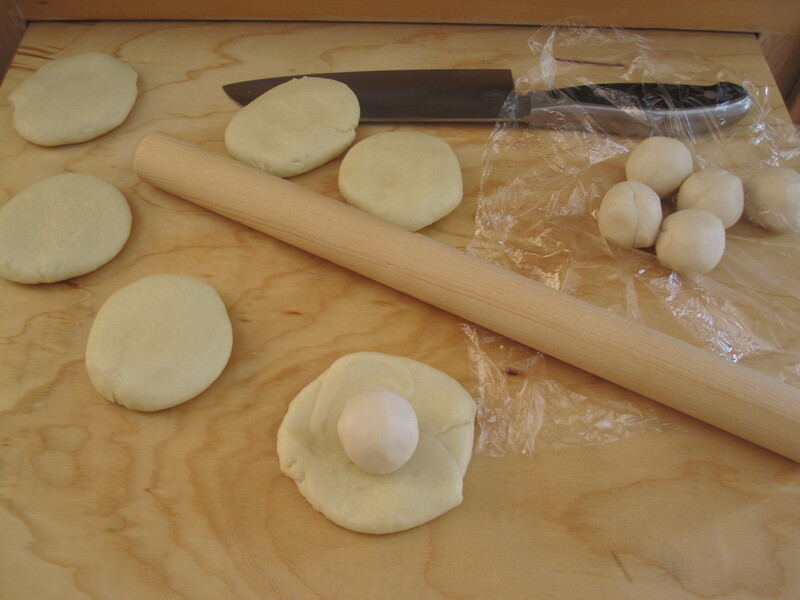 Use a rolling pin, roll the dough out (away from your body) to a thin long oval shape. Then roll it up like a jelly roll using your fingers (the dough will be “laying on the side”, looks like ” = “). Turn the dough 90 degree (the dough will be in “standing” position, looks like ” || “). With the end side facing up, roll it out to a thin long oval shape then roll up like a jelly roll again. Repeat this process with the remaining water dough and oil dough.With the end facing up, flatten the dough and roll into a circle. Repeat with the remaining doughs. Take a piece of dough, cut in the middle on the lengthwise. With the cut side facing up, flatten each piece with you palm, then roll out to a thin circle, for a total of 12 thin pieces of dough. Take care to keep the “eye” of the spiral at the center. Flip the dough over (so the cut side faces down– this will be the outside of the pastry), scoop in a portion of shredded daikon filling. Pleat (or pinch) and then twist tightly to seal the edge. Slightly shape into a ball. You should see the thin layering on the surface. Repeat with the remaining dough and filling. Place pastry on a baking pan lined with parchment paper (sealed side facing down), bake at preheated 375°F oven for 30 minutes. Cool on rack. 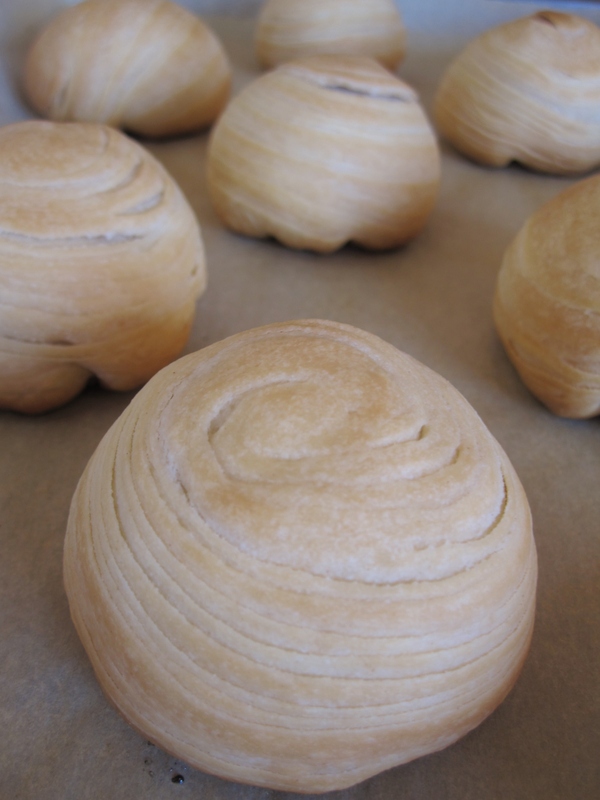 Making spiral pastry dough: wrap oil dough into water dough. 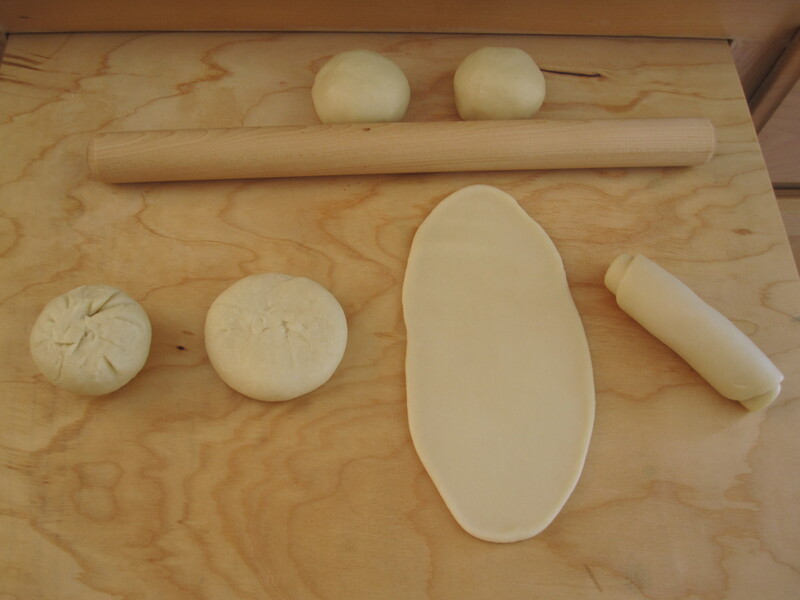 Steps for making spiral pastry dough (from left to right)-- (1) wrap oil dough into water dough, pinch to seal tight. (2) flatten dough with hand. 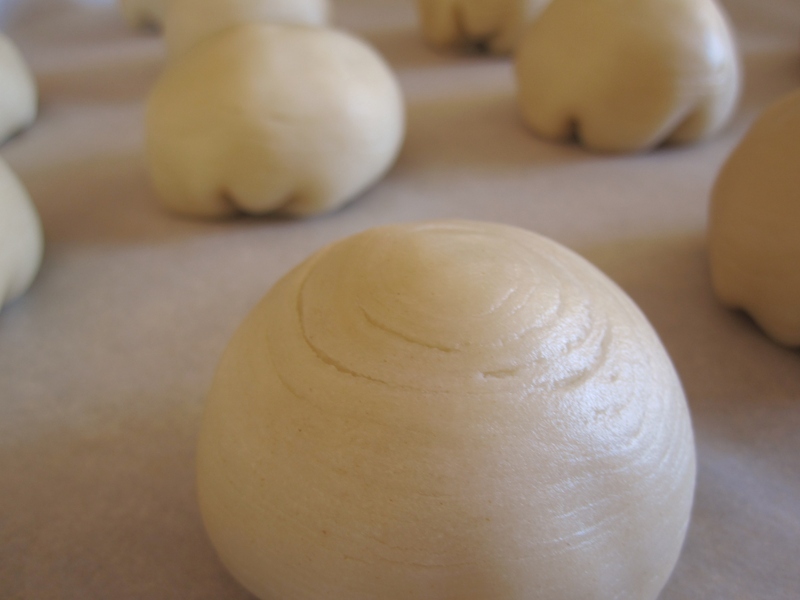 (3) roll the dough out to a thin long oval shape. (4) roll it up like a jelly roll. Steps for making spiral pastry dough-- (5) turn the dough to a "standing" position. (6) roll it out to a thin long oval shape again. (7) roll it up like a jelly roll again. 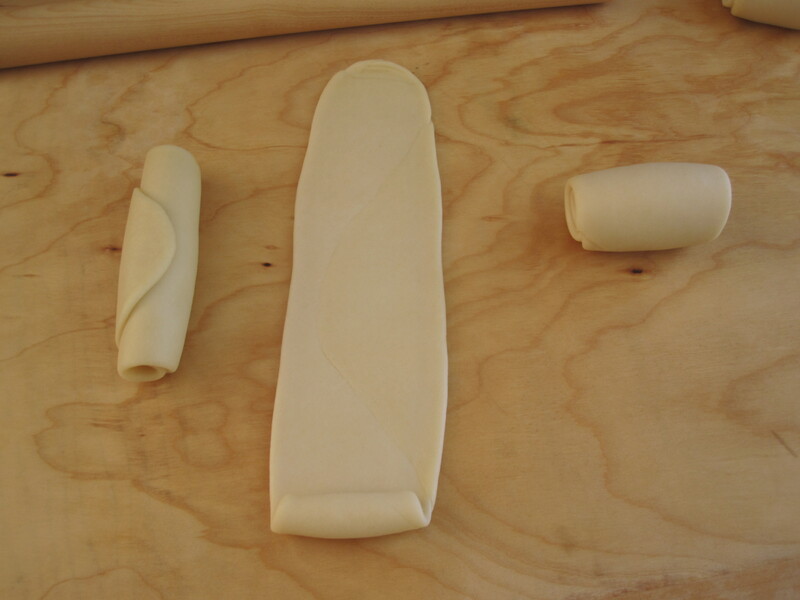 Steps for making spiral pastry dough-- (8) cut each dough in half lengthwise. See the swirl pattern from the cut side? 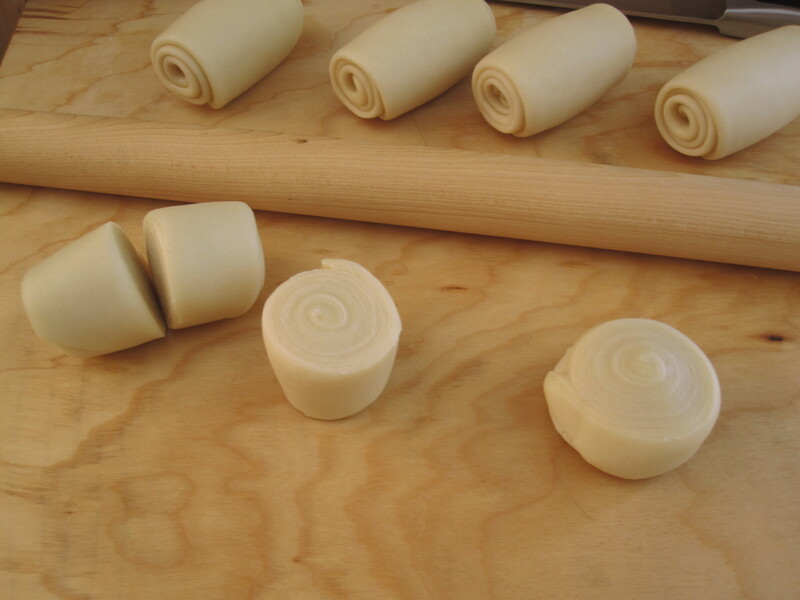 Making spiral pastry dough-- (9)flatten each piece of dough with hand then roll out to a thin disc. 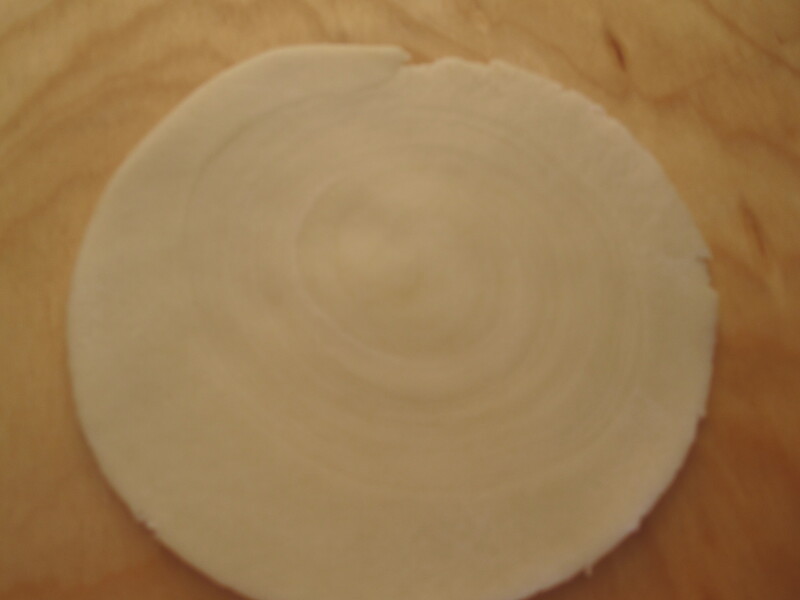 Keep the "eye" of the spiral in the center of while rolling out the dough. Now the dough is ready for filling. After wrapping in filling and before baking-- do you notice the layers of the pastry? Water dough and oil dough must have about the same pliable consistency. Pastry dough can be prepared ahead of time and chilled in fridge. It can also be frozen. Bring back to room temperature before using. 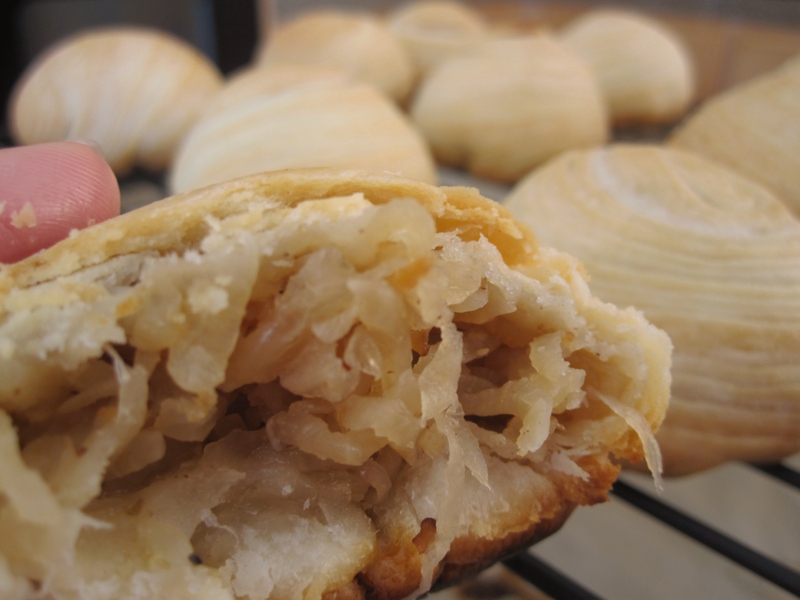 Shredded Daikon Pastry 萝卜丝酥-- I made these ones at a different time. I applied egg wash on the top since the layers of the pastry are not visible. In a bowl, rub in some generous amount of salt to daikon. Set aside to let it soften and for the liquid to draw out. Rinse a couple of times (depending on how much salt added), then squeeze out as much liquid as possible. Set aside. Heat up 2 tbsp of oil in a wok on high heat. Saute garlic and dried shrimps until aromatic. Add in daikon and cook until the flavor comes out. Add in water (start with 1/4 cup, add a little more at a time) and seasoning. Cook until daikon is soft and liquid dries out. Dish out to cool and divide into 12 portions.